Werner Herzog is a filmmaker who somewhat encapsulates the popular phrase "from the sublime to the ridiculous". Last year's Nicolas Cage-starring, iguana-obsessed feature 'Bad Lieutenant' being a prime example. Herzog has returned to his documentary making roots however with 'Cave Of Forgotten Dreams', his exploration into the oldest cave paintings ever found. The paintings at the Chauvet Cave in Southern France are over 32,000 years old and are permanently closed for the public - Herzog giving an international audience the unique opportunity to view the vivid paintings, which have retained much of their detail since their 1994 discovery but remain intensely fragile. "It is as if the modern human soul had awakened here", Herzog states upon encountering the paintings first-hand. Herzog's narration enlivens the experience. For example, the appearance of a footprint of a wolf next to the footprint of a young boy allows him to ponder aloud whether this was a hungry boy stalking the wolf or perhaps instead the two walked together as friends. Although this is somewhat ruined when he also notes that the footprints may have appeared thousands of years apart, and we'll never know anyway. Such frustration was generally my defacto emotion throughout 'Cave Of Forgotten Dreams'. While it is easy to appreciate the beauty and the history of the cave paintings, the philosophical meanderings into the implications of the nature of humanity failed to engage me. I'd have preferred hearing the stories of the master perfumier, the circus performer-turned-archaeologist, or the fella (I hesistate to use a word more formal) dressed in the bear skin. Perhaps strangely, the film was released in 3D and the Blu-ray edition also comes in 3D. While this may make the film experience slightly more immersive, I do not see the necessity. Barring the odd sweeping shot around the stunning vista that surrounds the area of the cave, I fail to understand why they have bothered with the 3D. Although admittedly, I'd have to see the film in 3D before completely writing off Herzog's creative decision. I've undoubtedly failed to understand a great deal more about 'Cave Of Forgotten Dreams' than simply the decision to release in 3D but nonetheless, the film left me feeling frustrated and with many more questions than answers. Perhaps the latter was Herzog's intention all along. But I wish it wasn't. 'Cave Of Forgotten Dreams' is available to purchase on DVD and 3D Blu-ray. 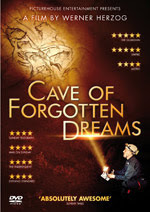 Enter our 'Cave Of Forgotten Dreams' competition to win a copy of the DVD.